You can have fun on an inflatable board in a wide range of conditions, enjoying it in different ways. For sure there will be a Unifiber board that fits your requirements and style. This page explains the different board types and their specifications, so that you can make the right choice. All-round SUP. This is the ideal board for beginners or for advanced paddlers who value versatility. 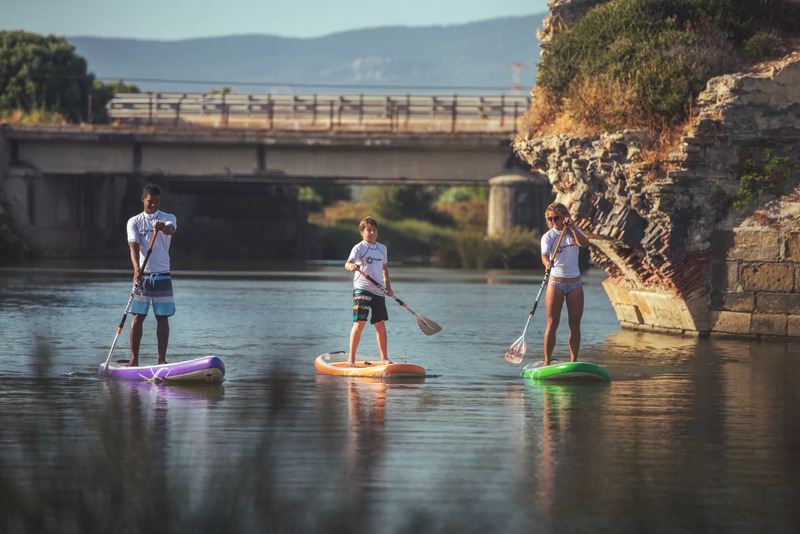 You can paddle around on flat water, discover the area, or try to catch a wave. These boards have average lengths and widths, and 'comfortable' volumes. WindSUP. An all-round SUP with the possibility to fix a windsurf sail. Ideal to paddle around on flat water, or glide over the water on wind power. The removable center fin prevents sideways drifting when windsurfing. Touring/Racing SUP. Made for speed and maximum gliding distance. The boards are long and narrow to minimize drag, and are constructed a little thicker for extra stiffness. Wave SUP. Although some brands have inflatable SUP boards that are dedicated for wave riding, it is impossible to come close to the performance of hard (epoxy) SUP surfboards. The production techniques for inflatable boards simply don't allow the dynamic board shape and sharp rails that are required to make carving turns on a wave. Yoga/exercise SUP. The boards are wider to make them more stable. They also have some convenient features, such as an extra large EVA patch and a strap to securely store your paddle. XL SUPs. Because of their extreme buoyancy, inflatable boards can support the weight of more than one person. Some boards are specially made for this purpose: having fun with friends. They are extra large, some are large enough to paddle out with 8 friends! Width: Wider boards are more stable, but have more drag. For this reason racing boards are narrow: they are fast, but more difficult to balance on. If the board is very wide then moving the paddle from one side of the board to the other is more awkward and inefficient. Thickness: By making a board thicker, the stiffness and volume are increased. A negative is that the higher sidewalls catch the wind more, so more effort is required to maintain a course. Volume: The more volume a board has, the more buoyancy it has. Light paddlers might prefer smaller boards because these are easier to manoeuvre. Heavier paddlers will probably prefer boards with more volume because they are more stable. An incidental downside of very high volume boards is that a lot more pumping is required to fill the board with air! The way a board is constructed influences the stiffness, weight and durability of a board. Stiffness is very important, as a flat board has much less drag than a board that bends under the load of the paddler. All inflatable boards are made with 'dropstitch' PVC. This material is made of 2 layers of fibre-reinforced PVC that are connected by vertical threads. See below image. The length of these threads define the thickness of the board. Because all the threads have the same length, the top and bottom of the boards are perfectly flat. The boards get some scoop / rocker through the shape of the side wall 'rails', and by making the top layer a bit shorter than the bottom layer. Single layer. Cheap, but poor performance. If your board is more than just a toy for your kids, we would strongly suggest buying a better board. Double layer. The board is reinforced by an extra layer of fibre-reinforced PVC laminate. A little heavier than single layer, but much stiffer and much more durable. MSL Fusion. The best. More fibres, less PVC and less glue than the double layer construction. This makes the boards lighter and stiffer. All Unifiber boards are constructed with MSL Fusion. Some brands add stringers with Kevlar or Dyneema fibers to make the boards even stiffer. But this also makes the boards very expensive. Thruster. One large fin and two small side fins. The side fins make the board more stable and easier to turn. This set-up is ideal for all-round boards. You can even catch some waves with this set-up! Single fin. One large fin. This set-up is ideal for touring and racing. The drag is kept to a minimum. Single fin + centre fin. One large fin at the rear end of the board, plus one large fin placed in the middle of the board. This set-up is ideal for boards than take a windsurf sail. The center fin helps to prevent sideways drifting. The iWindsurf boards have a sharp PVC rail. This gives the board more grip on the water, to prevent sideways drift. It also greatly improves water-release at higher speeds, making the boards suitable for planing.